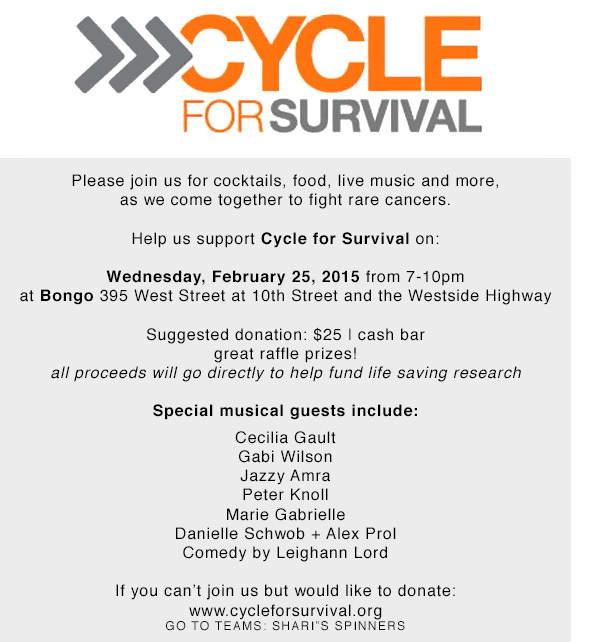 Tonight, we are hosting a very special event on behalf of Cycle for Survival. Please join us to enjoy great performances, wonderful food and drinks, win amazing raffle prizes and more importantly, help us raise money for research and clinical trials to fight rare forms of cancer. Every dollar raised will be matched, and all funds go directly into global lifesaving research at Memorial Sloane Kettering Hospital. All of us have been touched by cancer in some way, and we all know how devastating this disease can be. Help us imagine a world where it can be cured, or even eradicated. This entry was posted on February 25, 2015 at 7:29 am and is filed under Uncategorized. You can follow any responses to this entry through the RSS 2.0 feed. You can leave a response, or trackback from your own site.